Hole 9 is a long par 5. Slightly up hill to this hole with the fairway slanting hard right. A slice could end up in a line of trees or even below them, making it difficult to shoot at the green with any shot. 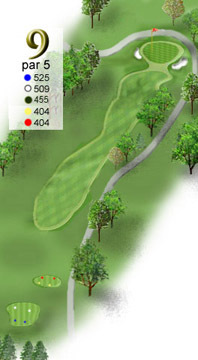 there are also trees on the left side and from 150 yards in could save you from hitting a shot into the parking lot. Secret here, keep it centered.